Historic Bronte House is a magnificent, mid-Victorian mansion and an outstanding example of a picturesque Gothic-style colonial residence. 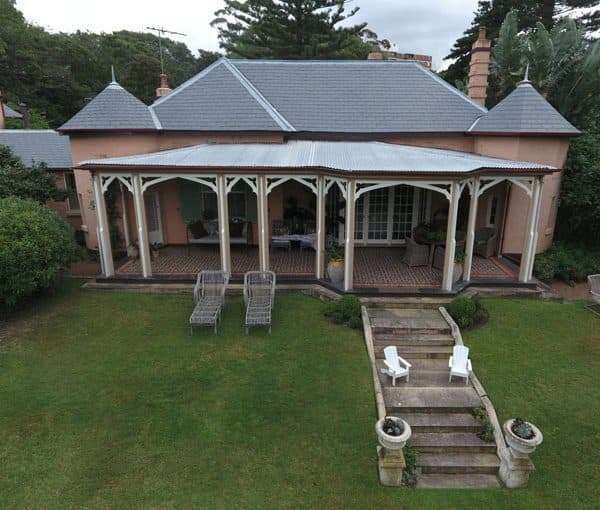 It retains rare features of its early architectural design, and is the oldest house in the Waverly local government area in Sydney’s eastern suburbs. Since it was built in 1845, it has belonged to many owners, many of whom made piece-meal additions and alternations to the building, often insensitive to the original design. By 1980, and then owned by Waverly Council since 1948, the house had fallen into disrepair. Thankfully, the council agreed on decisive action to see the property restored, without subjecting its ratepayers to the bill. They would lease the house for a peppercorn rent ($1/year) for 25 years to an individual or individuals willing to pay for the extensive repairs. Restoration works began in 1980 but stopped in 1984. Arts organiser Leo Schofield assumed responsibility for the lease in 1994 and resumed extensive restoration of the house and garden between 1995-2002. Scofield’s restoration was in keeping with the original construction by Robert and Georgina Lowe (who bought the unfinished property from the colonial architect Mortimer Lewis for a song in 1843). In 2014, Slate Roofing Australia, the preferred roofing contractor for many government institutions, was contracted to replace the roof of Bronte House with Welsh slate. At the time of the roof restoration, Welsh Penrhyn slate tiles were in short supply. To accomplish a superior finish required the expertise of SRA’s master slaters, who completed the roof using a delicate balance of both Penrhyn and Welsh Cwt-y-Bugail slate.